With Facebook’s recent introduction of timeline for pages, business brands got a new way to manage and monitor their reach to fans through the admin panel. Here brands can see what content is interesting to fans and what the conversation is like surrounding that content. The newest feature for brand pages enables brands to view the percent of fans that are reached for every piece of content posted on the page. According to Facebook, the average post on a brand page only reaches about 16% of its fans – not as high as most brands would like. This new feature, available to brand pages only – is a quick and easy way to see how many fans see what your brand posts. In this episode of the Future of Engagement, Murray Newlands takes a look at the recently released feature and discusses both the conversation surrounding it and what it can do for your brand. This graph was created using the social media monitoring tool Alerti.com. A look at the graph above shows the range of responses to this new feature on Facebook page Timeline. 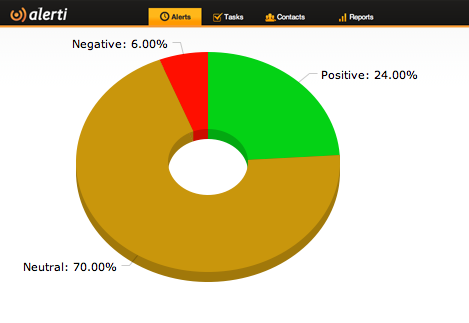 Most of the commentary surrounding the new feature centered on sharing information about it, however almost a quarter of commentary was positive. This shows the effectiveness of the feature for brand pages.